Hiya crafty peeps! 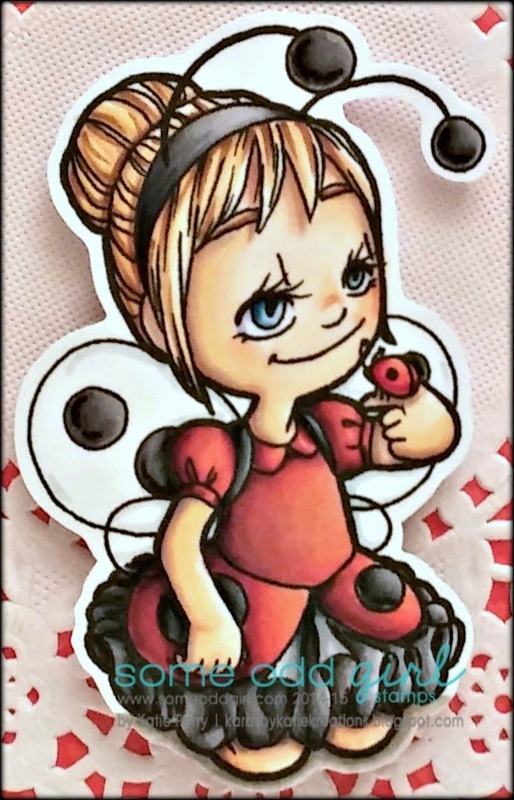 It's been a busy week over at Some Odd Girl and since my blog was hopping with the new clear release on Tuesday I decided to share this new digi on a different day so it wouldn't miss out on it's own little spotlight...please meet Lady Bug Tia- isn't she just too freakin' adorable?!? Nothing screams springtime to me like ladybugs- I remember being young and counting the number of black spots because that showed how old they were :) I colored her with my Copics, naturally lol, and paired her with some paper from Doodlebug designs. For the card base I actually took a black chipboard page from a Cosmo Cricket mini album and I plan on tying two of the pages together with some red and white baker's twine from Doodlebug designs- it just would have been hard to photograph them already tied together. I love using pieces of chipboard albums for all different kinds of projects since you can find them in all sorts of different shapes and finishes- I'm all about multipurpose items, lol! Make sure you pop on over to the Some Odd Girl store to check out this and all the other images that have been released this week, both clear and digi :) Thanks for stopping in to visit! Gosh Katie, this is so cute! I love that little lady bug Tia! Thanks for joining us at Oddball Art Stamps challenge! This card is precious. I love the colors and the image. Thanks so much for joining us at Aud Sentiments for our friend challenge. Your shaped card is darling!